Follow steep paths and back roads through the island of Thirassia on a 5-hour, small-group tour from Santorini that explores the best of a picturesque, volcanic island. Discover a landscape of arid hillsides and villages that are lost in time, find abandoned cave houses and walk through terraced vineyards and local gardens. Arrive in a church courtyard for a lunch of homemade wine and traditional Greek food, then learn how Thirassia wine is made in a local, priest-run winery. Meet your guide at your Santorini hotel, and travel to the port of Ammoudi to catch a boat to Thirassia. Step onto the island at the port of Korfos, a seaside village that’s inside the volcanic caldera, then climb 180 steep steps to Manolas—for an additional charge, you may ride a donkey up the hillside. Get perfect views of the sea from the traditional community, where bougainvillea trees spill over the narrow, winding lanes and brightly-painted doors. Pause at a local tavern to enjoy the shade and learn about Thirassia’s ancient past and culture, local farming and wine production, then hike through a series of vegetable gardens, trellised grape vines and wild herbs on your way to Akrilia. 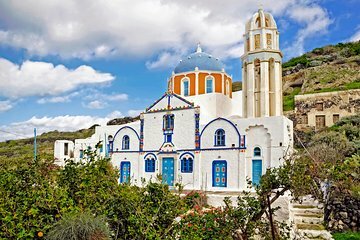 Trace a route through the eerie cave houses in a deserted village that was once the island’s biggest settlement, and see the Virgin Mary Church at the town center—you’ll arrive to a traditional Greek lunch and wines made by local priests. After visiting the priests' winery, board a boat back to Santorini in the port of Riva and finish the day at your Santorini accommodations.